Flair Air (formerly New Leaf) is showing flights from Toronto to Vancouver, BC for travel in the summer of 2018 for $298 CAD roundtrip including taxes. The flights have 1 stop each way. They are also showing non-stop flights from Toronto to Edmonton in the summer months for a similar price ($289 CAD roundtrip). Vice-versa trips (eg: Vancouver / Edmonton to Toronto) are also available for the same price. 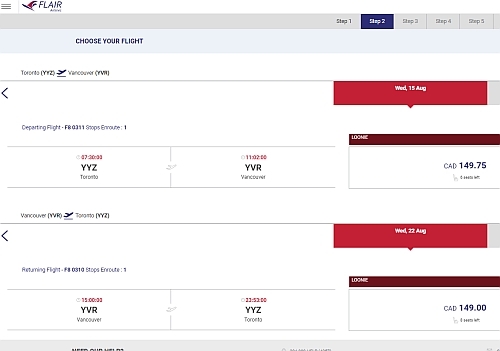 For comparison, Air Canada, WestJet, and Air Transat are currently charging a minimum of $592 to $692 roundtrip for summer flights to Vancouver. Although it should be noted that those are non-stop flights, while these Flair Air flights do have 1 stop each way. To top it all off, Flair Air also recently dropped their extra charge for carry-on baggage. Their lowest prices now include both a personal item and carry-on. Vice-versa trips are also available for the same price, for anyone that wants to come visit you in Toronto or Hamilton. Update @ 1:17 PM EST - The Flair Air website has been having issues loading, I'm assuming from too much traffic. I've found that if you hit F5 (refresh) in your browser after getting to the blank page, it may load. 2. Search for a flight from Toronto (YYZ) or Hamilton (YHM) to one of the cities listed above. toronto, yyz, flight deals, vancouver, british columbia, yvr, bc, alberta, hamilton, yhm, kelowna, ylw, winnipeg, manitoba, ywg, abbotsford, yxx, edmonton, yeg and flair airlines. 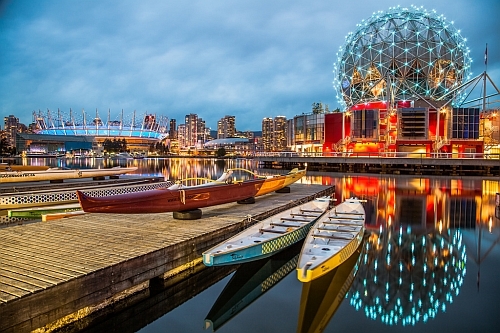 4 Responses to "Toronto to Vancouver, BC (or vice versa) - $298 CAD roundtrip including taxes | peak summer 2018 travel"
has anyone flown with Flair Air before? Website is really really slow . Is there any other way to book? I got pretty far and then cancelled... the site took me to seat selection but didn't tell me it was extra. Once I had selected I couldn't unselect. Also, on the booking page it said there was one stop-over but I couldn't get any information on where and for how long. By the time I had gotten to the pay page, the total length of the trip from YYZ - YVR had become 12 hours. I didn't feel comfortable having so many questions remaining so I just cancelled. Too bad, it's a good price - but it doesn't mean I should just buy blind and that's what it seems that they want me to do.